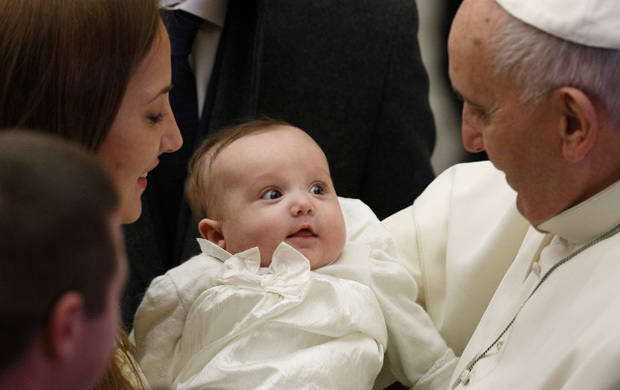 VATICAN CITY (CNS) — Mothers are indispensable to society and the church, showing the world what it means to generously give oneself for others, to respect life and to display tenderness and moral strength even in times of trouble, Pope Francis said. 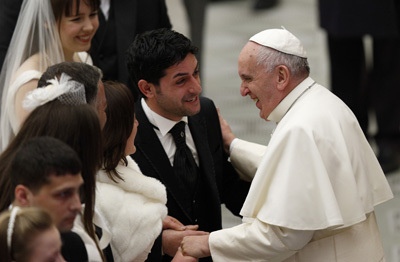 Speaking to some 4,000 people gathered indoors for his general audience Jan. 7, the pope continued his series of talks about the family, but also gave a second talk about beauty and harmony when he thanked a group of circus performers at the end of the audience. Tying the theme of the family to the church’s celebration of the feast of Mary, Mother of God, Jan. 1, and the Epiphany Jan. 6, the pope looked specifically at Mary’s role in the Gospel accounts of Christmas. “She gives us Jesus, she shows us Jesus, she lets us see Jesus,” the pope said. “One should better understand their daily struggle to be efficient at work and attentive and loving in their family; it is necessary to better understand what they are striving for in order to express the best and most authentic fruits of their liberation,” he said. Pope Francis recalled his own upbringing as one of five children, and spoke of how much work and how many problems, but also how much happiness, come with motherhood. “Mothers are the strongest antidote to the spread of selfish individualism,” he said. If societies do not do justice to the contributions and sacrifices of mothers, the church is not always better, he said. “Perhaps mothers, who are ready to make many sacrifices for their children and often also for others” should find greater reception and attention in the church, he said. Mothers are the biggest enemies of war, “which kills their children,” he said, admitting he has thought many times of those women who receive the dreaded letter notifying them of the loss of their children in their defense of the nation. “Poor women. How much a mother suffers,” he said solemnly. Mothers are martyrs, the pope said quoting a homily by Salvadoran Archbishop Oscar Romero, who was shot and killed in 1980 as he celebrated Mass. Presiding over the funeral Mass of a priest who had been assassinated by the country’s death squads, the late archbishop had said that giving one’s life does not just mean being killed for the faith, it is also offering oneself “in that silence of daily life,” bit by bit, “like a mother, who, without fear and with the simplicity of maternal martyrdom, conceives a child in her womb, brings it into the world, nurses it, raises it and lovingly cares” for the child. But while people today are well-practiced in “the language of the mind, thinking” and “the language of the hands, doing,” they need to remember to use “the language of the heart, loving,” he said. “These three languages come together to make up the harmony of the person; and there is the beauty,” he said. In a brief address to German and Polish-speaking groups attending the audience, the pope also greeted a delegation of people who survived the Auschwitz concentration camp and were freed 70 years ago in January.